Posted by Eddie & filed under Military/Aircraft, Mountains & hills, September 23 2011. Three days ago I travelled to the Galloway Hills and walked to the 814m summit of Corserine from Forrest Bridge, through a large forest plantation and steep grassy slopes. Approaching the summit via North Gairy Top, I saw the unusual sight of a herd of wild goats, although I have now seen wild goats on various mountains in Scotland, including An Teallach and Slioch in the north-west Highlands and Swatte Fell in the Borders. 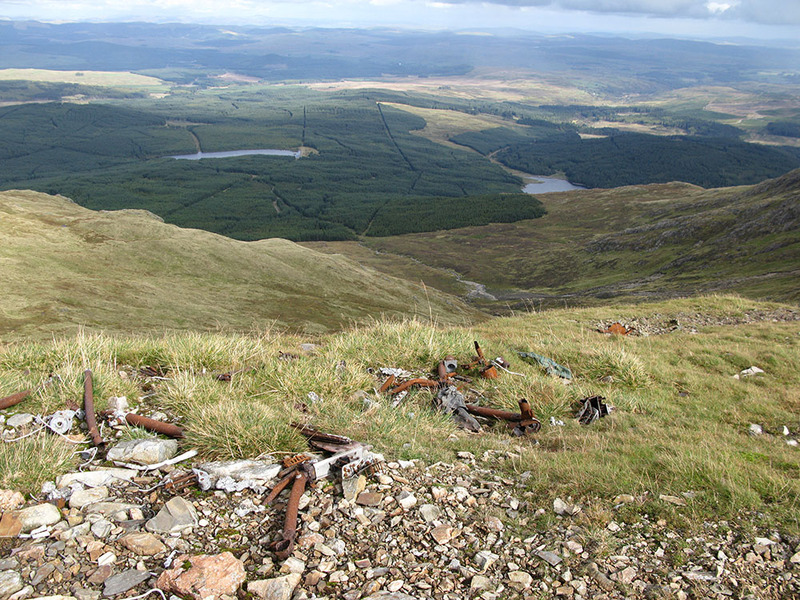 The summit plateau of Corserine contains the wreck sites of two aircraft from crashes during the Second World War less than 1km apart, a de Havilland Mosquito and an Avro Anson. 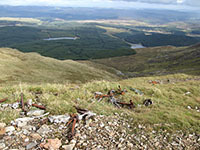 The Mosquito wreck site is about 700m east of the summit of Corserine at the eastern edge of the summit plateau near an area called ‘Scar of the Folk’ on the OS 1:25000 map, at an altitude of about 780m. At the site is a small debris field with some small pieces of wreckage remaining, including parts of the undercarriage mechanism. Some parts of the Mosquito’s wooden frame are still recognisable. At the site of the Anson crash there is a small scar about 150m north-west of the summit trig-point of Corserine at an altitude of about 800m. In the scar very little is left of the Anson, except a few small pieces of rusted metal and the only identifiable part, a battery. After visiting these sites, I walked on to the neighbouring summit of Carlin’s Cairn. Below the steep slope of Castlemaddy Gairy to the east of the summit of Carlin’s Cairn, there apparently lies some wreckage from a Belgian Air Force Dakota that crashed near the summit of Carlin’s Cairn in 1947, although despite a good search through another forest plantation at the site, I was unable to find any of this wreckage. Perhaps this remaining wreckage has been cleared away by someone in recent years. The walk back from this location around Craignelder back to Forrest Bridge was a complete nightmare of forest tracks that didn’t agree with the map, boggy and tussocky ground, rivers to cross and new-cut forest debris making the terrain extremely difficult to traverse. An area to be avoided by walkers at all costs! You can see my page about these wreck sites on my website here.